A dash of cornmeal gives these cookies a nice crunch, and fresh rosemary and tangerine zest give them a one-two punch of herbal citrus flavor. 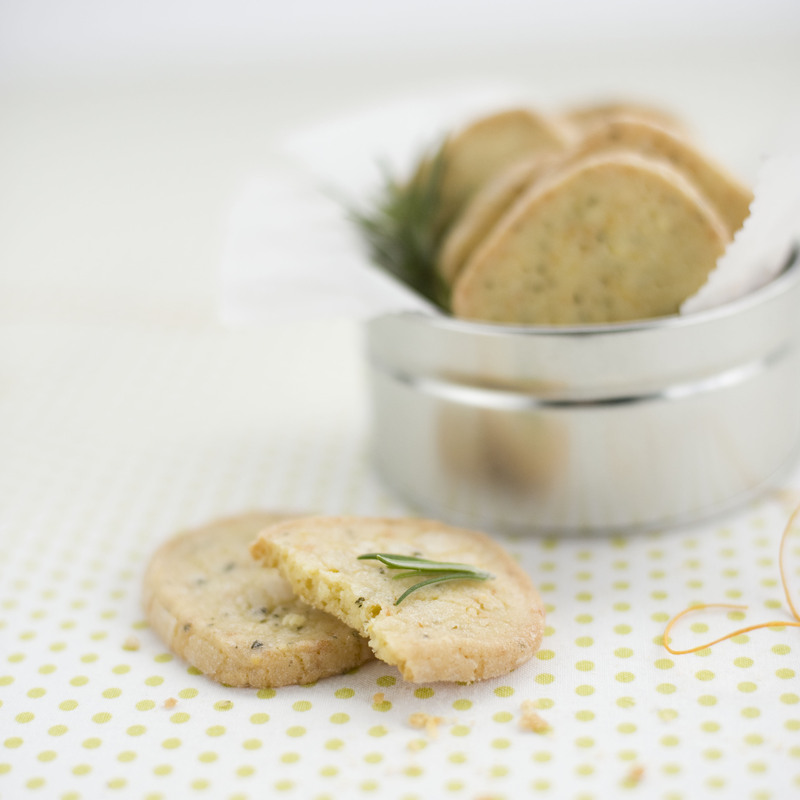 They’re perfect to nibble on with a mug of tea or scoop yourself up a big bowl of lemon curd and start dipping. IN A MEDIUM BOWL, whisk together the flour, cornmeal, and salt. IN THE BOWL OF A STAND MIXER fitted with a paddle attachment, beat the butter and granulated sugar on medium-high speed until incorporated but not fluffy, about one minute. Scrape down the sides of the bowl. Add the citrus zest, rosemary, and egg yolks, one at a time, beating just until incorporated. Scrape down the sides of the bowl and add the dry ingredients. With the mixer on low, mix just until combined. SCRAPE THE DOUGH OUT onto a lightly floured surface, gather it into a ball, and divide the ball in half. With floured hands, shape each half into a 12-inch-long log, pressing the sides against the work surface to flatten them so that the cookies will end up square. Wrap tightly in plastic wrap or waxed paper and twist the ends. Refrigerate for several hours or until completely firm. PREHEAT THE OVEN to 350°F. Line two large baking sheets with parchment paper or Silpats. Put the superfine sugar in a small bowl. CUT THE LOG CROSSWISE into 1/3- to 1/2-inch-thick slices. Toss each slice in the sugar to coat. Place the cookies at least one inch apart on the prepared baking sheets. Bake until the edges are lightly golden, 15 to 17 minutes, rotating the sheets from front to back and between upper and lower racks halfway through. LET THE COOKIES COOL for several minutes on the baking sheets before transferring them to a wire rack to cool completely. They will keep in an airtight container for at least one week.